A smile makeover is a comprehensive cosmetic dentistry process of improving the appearance of the smile and is essentially something that you chose to have performed. Before your smile makeover plan is developed your cosmetic dentist must first evaluate the condition of your oral health. There is no one set of rules for a smile makeover, they are highly involved procedures and must be customized to individual circumstances. Your cosmetic dentist will evaluate your teeth, gums, underlying support structure and bite (occlusion) to determine candidacy for a smile makeover. 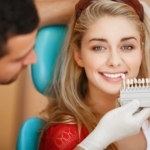 If you have any previous oral health problems they will need to be addressed prior to your smile makeover treatment. Porcelain Veneers are ultra-thin, custom-made porcelain shells of tooth-colored ceramic materials designed to cover the front surface of teeth to improve their appearance or repair damage. Porcelain Veneers are prepared in a dental lab based on a mold provided by the dentist and they are bonded to the front side of teeth changing their color, shape, size or length. Porcelain veneers can match our natural tooth color offering a uniform and authentic appearance. The procedure requires little or no anesthesia, and can be performed by general and cosmetic dentists. 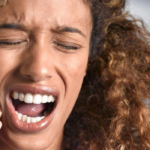 cracked teeth or even to cover spaces in between the teeth. In the initial consultation with the dentist you will discuss your oral health history, present condition, and your goals for your Smile Makeover. 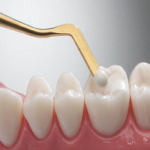 Special cement is applied to the veneer and the veneer is then placed on your tooth. Once properly position on the tooth, your dentist will apply a special light beam to the dental veneer, which activates chemicals in the cement, causing it to harden or cure very quickly.